Women with menopausal depression who are tired of the side effects and costly prices of prescription medicine can turn to alternative medicine. Alternative medicine can mean a lot of things: from herbs and teas to supplements and aromatherapy, many women benefit from using this kind of medicine, with a reduced risk of side effects. At the turn of the 1900s, women were given all sorts of medications during and prior to menopause to calm symptoms that were termed "hysterics". Nowadays, women are usually given hormonal medication to balance the rapid hormonal changes that occur during menopause. 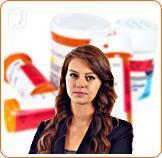 There are a wide range of hormonal medications on the market. Some hormonal drugs have only light side effects, whereas others cause serious side effects that need to be treated with additional medication. It is important to note that some heavier hormonal medication may only be taken for a limited amount of time. Because of the health risks involved in prescription hormonal medication, many women prefer alternative medicine. Alternative medicine is natural and involves a variety of different approaches and supplements. Most are aimed at getting the body back in shape and promoting well-being. Mood disorders are thought to be caused by chemical changes in the brain and can affect women during, before, and after menopause. A variety of herbs and vitamins have been used to treat menopausal depression. There are many natural options available that can help women to manage their depression. Omega-3 fatty acids. These fatty acids help protect the brain and may especially benefit those women on a low fat diet. These healthy fats are found in foods such as cold-water fish, flaxseed, flax oil, and walnuts. They can also be found in supplement form. St. John's wort. Also known as hypericum perforatum, this is an herb that's been used for centuries to treat many illnesses. It's classified as a dietary supplement but used for depression treatment in Europe. These natural techniques pose few risks, both physically and mentally. They are generally beneficial for overall health and well-being and are good practices whether you are suffering from menopausal depression or not. It is important to remember that you can't have a healthy mind without a healthy body, since the two are closely connected. Alternative medicines are enjoyed by many people, come with few to no health risks, and can usually be taken alongside prescription medication. Alternative medicines for depression come in all shapes and forms. If you want to try natural options, it is important to find one that will suit your lifestyle and address your symptoms. If you have severe depression or feel that you may be suffering from a more serious medical condition, it's important to talk to your doctor, as depression can have serious mental and physical consequences. For more information on depression during menopause and how to treat it, follow the links below. University of Michigan Depression Center.(n.d). "Women and Depression: Menopause". Retrieved from www.med.umich.edu. Many women going through menopause suffer from depression. However, depression should not be an accepted part of menopause. Natural remedies, like exercise and herbal remedies, can be beneficial for treating depression. Keep reading to learn more. Living with depression is painful, and it can be hard to help your partner if they are depressed. Click here for ways to support a depressed partner.